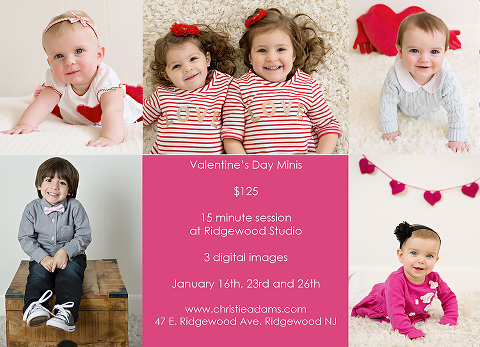 I’m excited to announce 4th Annual Valentine’s Day Mini Sessions at my Ridgewood studio in Bergen County! They will take place on 3 days (January 16th, 23rd and 26th) and include 3 digital images for $125. After the session, there will be the option to add on additional digital images as well as prints, Valentine’s Day cards or bookmarks. Christie Adams Photography has been in business since 2007 and is a NJ Baby Photographer with a studio in downtown Ridgewood.